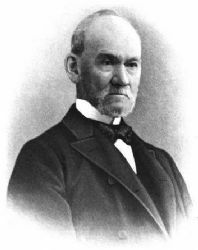 Samuel H. Treat, Jr., was a New York State native who in 1834 immigrated to Springfield, Illinois, where he lived for the rest of his life. In 1839 Treat began his service ed as judge on the Eighth Circuit; he was named to the Illinois Supreme Court a year later. (When Treat was appointed to the bench, he vacated his position as a Springfield trustee – a position to which Lincoln was then appointed.) Treat continued to preside over the Eighth Judicial Circuit until 1848 when David Davis took over – after the law was changed so that State Supreme Court judges no longer presided over district courts. One morning in the winter of 1858, recalled Lincoln law partner William H. Herndon, Lincoln was particularly despondent over the attitude of eastern Republicans like New York Tribune editor Horace Greeley toward Senator Stephen A. Douglas: “Greeley’s letters were driving the enthusiasm out of him. He seemed unwilling to attend to any business, and finally, just before noon, left the office, going over to the United States Court room to play a game of chess with Judge Treat, and did not return again that day. Douglas L. Wilson and Rodney O. Davis, editors, Herndon’s Informants, p. 483 (William H. Herndon interview with Judge Samuel Treat.). CWAL, Volume, p. 501-50 (Letter from Abraham Lincoln to Samuel Treat, November 19,1862). John McAuley Palmer, The Bench and the Bar of Illinois, p. 35. Jesse W. Weik, The Real Lincoln, p. 102-103. Michael Burlingame, Abraham Lincoln: A Life, Volume I, p. 318. Daniel W. Stowell, “Abraham Lincoln: Lawyer, Leader, President”, http://www.lmunet.edu/alinstitute/speech-stowell.shtml, . Usher Linder, Reminiscences of the Early Bar and Bench of Illinois, p. 388-389. William H. Herndon and Jesse Weik, Herndon’s Life of Lincoln, p. Herndon’s Life of Lincoln.